It occurred to me that I've been spending far too much time on the computer lately (yes, really), so I'm shamelessly stealing Staci's idea from a few weeks ago and staying off the internet today. (And in case you're wondering, I'm writing this on Saturday). I thought I'd leave you with a video by my latest musical obsession, Fanfarlo. They're good! They're very, very good! And look what they list under influences: "David Lynch, Kurt Vonnegut, Talking Heads, Television, Sufjan Stevens." Hearts. Have now finished listening to music, and it was marvelous. You should share your favourite music videos more often! I always enjoy them, and am a music dunce, so need help finding good bands. My cat sleeps like that. I guess it DOES look comfy! Cracks me up. I am with you on the Internet insanity. I keep telling myself that once I get my panelist responsibilities done (finished this morning! ), I'm going to take a break. LOVE that band. I'm going to have to do some exploring on iTunes! Righteous band, perfect for a Sunday afternoon! I love it when bands use the violin. Think I will have to go do a little searching for some of their tunes. Enjoy your day off! ! ! Have a great day, Ana! I hope it's relaxing! 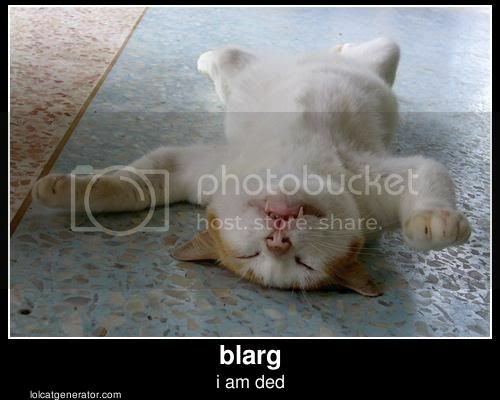 I love the picture "Blarg"! Very cute! Hope you're doing the same thing! Very, very Sufjan! I'm going to have to give this one a few more listens, but I really love their band name. Fanfarlo! So cute! I love the cat picture! Have a great day! Hope you enjoy your "day off"!!! and have a relaxing time. Great lolcats. I think I'd enjoy listening to their music but I've never been a huge video fan - unless there's a montage or something attached. I'm so old school that I believe music is to be listened to, not watched, you know? Have a great day off, my dear. You deserve it. I did the same Friday night through Saturday night. It was heaven. ENJOY! Hope you're having the best day off ever!! Just stopping in to say hello!! I hope you'll do the same! I MISS YOU!! Good for you taking a day off. I panic when I do that as my Google reader goes through the roof. Have a wonderful day off! It's great to take some time away and come back refreshed. Sometimes a break is just what we need. Enjoy your day off, Nymeth. And thanks for sharing the video! SUCH a good idea - I'm planning on being disconnected while I'm on vacation later this week. I hope you're enjoying your day off! LOL. I love that pic. The kitty is adorable!! I think I should do this too, but then I'm not much on the internet on weekends except maybe for an hour or two. That’s okay right? Thanks, everyone! It ended up being a feeling-blah-because-it's-too-hot-and-not-doing-much-of-anything sort of day, but you know what, that's the sort of day I needed. I need to take internet free days a bit more often! It's addicting. David Lynch, Kurt Vonnegut, Talking Heads...no way they're not going to be awesome!!!! And I do love this song! Will have to check out more of their stuff. And *slaps self upside the head* I MUST check out more Sufjan Stevens. Must. Hope your day off was lazy and relaxing and reviving! It certainly does feel good to get away once in a while, doesn't it? OMG...I am a sucker for cat photos :) very fun! I hope you made some time to be like that cat!!! Love it! !